Offering you a complete choice of products which include dr fixit 112 pidifin 2k, dr. fixit roofseal flex, dr fixit fastflex 12 kg and dr fixit roofseal flex 12.5 kg. Concrete roof slabs, floors, balcony floor slabs. Waterproof coating (bottom coat) for marble, granite and other natural stones. Suitable for steam room waterproofing. for special applications such as areas where more thick plaster application is needed. Flexibility - Provides a flexible & low permeable coating. Water permeability - Excellent resistance to ingress of water. Slip resistant - Provides slip resistant coating. Waterproof - Waterproof for concrete structures. Adhesion - Excellent adhesion to concrete, natural and artificial stone. Diffusion - Excellent resistance to chloride ion diffusion and carbon dioxide. Low temperature resistant - Resistance to freeze-thaw cycles and de-icing salts. Carbonation - Prevents carbonation of cement concrete. Clean The Dust By Air Compressor Or Wash The Surface With Water. Oil & Grease Must Be Removed Using Degreasing Solvents. Any Damaged Surface Must Be Repaired By Using Polymer Modified Repair Mortar. Two Coat Of Mixed Slurry To Be Applied To The Set Concrete @ 1.5 - 2Kg/M2 By A Masonry Brush, Roller Or Appropriate Power Spray Equipment. Two Coats Of Mixed Slurry To Be Applied On To The Pile Head @ 0.75Kg/M2 First Coat And 1.25 To 1.5 Kg/M2. 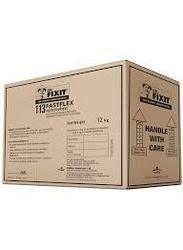 Two Coat Of Dr. Fixit Pidifin 2K Applied @ 1.5 Kg/M2 Each Coat By A Masonry Brush Or An Appropriate Power Spray Equipment. All Applications Where Two Coats Is Specified, The Second Coat Shall Be Applied When The First Coat Is Completely Dried. 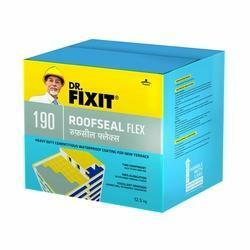 Dr. Fixit Roofseal Flex is a two component cementitious coating, composed of high quality cement, properly selected & graded fillers, additives and acrylic polymer. It is suitable for achieving waterproofing for roofs, because it provides strong bonding, good waterproofing and excellent resistant to hydrostatic water pressure by forming highly elastic seamless coating over the applied concrete surfaces. High film built-up - withstand 5 m hydrostatic pressure without any leakages. Ease of application - Easily applied by brush. Surface Should Be Sound, Clean And Free From Dirt, Oil And Other Loose Material. Concrete Surfaces Should Be Fully Cured (Minimum 28 Days) Prior To Application. All Surface Cracks, Undulations And Voids Must Be Repaired Appropriately Before Application. Use Slow Speed Mechanical Mixer, Add Powder Component Slowly To The Polymer Ina Clean Container. Stir Till Smooth And Homogeneous Slurry, Without Any Lumps, Is Achieved. Allow The Mixed Slurry To Stand For 5-10 Minutes For Releasing Entrapped Air During Mixing. Allow The 1St Coat To Dry Completely For 6-8 Hrs Before Applying 2Nd Coat. Carry Out Pond Test Post Curing Of Final Coat And Prior To Covering The Coating With A Screed. After Full Curing Of Second Coat For At Least 7 Days, A Water Ponding Test Can Be Performed By Filling Water On The Terrace By Carefully Blocking All The Down Take Drain Outlets Without Damaging The Coating. The Test Shall Be Carried Out For 48 Hrs By Filling Water Up To 50 Mm Level. Observe For Leakages If Any And Then Remove The Water And Allow The Coating To Dry Completely. the complete exposed flat area including up stand areas for the protection of applied coating. Spread 100 gsm/m2 geotextile over cured Dr. Fixit Roofseal Flex as separation layer, before a concrete screed is laid. Protect the coating with a concrete screed in M 20 grade. The protective screed of 40-50 mm (minimum) thickness maintaining an average slope of 1:100 towards the drain outlets for effective and efficient draining of water. The composition of screed should be 1:1.5:3 i.e. Cement: Sand: Aggregate with aggregate size 20 mm down. The screed should also have poly propylene fibre 12 mm length & should not be less than 150 gram per 50 kg bag of cement. 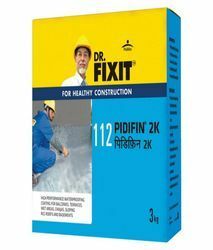 Looking for “Dr Fixit Pidifin 2K”?